Contact - Kain-Murphy Funeral Services-Serving Haddonfield, Cherry Hill, Haddon Heights, Haddon Township and surroundings. 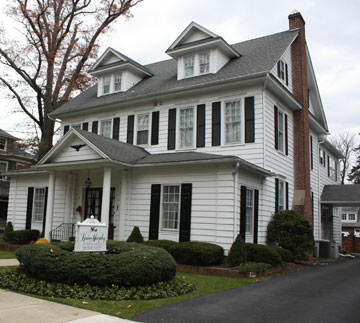 Kain-Murphy Funeral Services is located in Haddonfield, a community founded in 1713 by Elizabeth Haddon. The historic district is listed on both the State and National Registers of Historic Places.The town is home to many architecturally significant older homes. The Borough of Haddonfield is convenient to Route 295 for travel from north or south Jersey. Take exit 32 and continue for just a little over one mile. As you enter Haddonfield, there are baseball fields to your right. Bear left to the traffic light. Go through this light; the next traffic light is the intersection of Kings Highway. Turn left and go through the business district. Continue West on Kings Highway to West End Avenue. Turn Right. The funeral home is on the first block. Haddonfield is a stop on the Patco High Speed Line which runs from Philadelphia. It can also be reached by taking the Ben Franklin Bridge to Rt 70 East and exiting at Grove Street. Grove Street will take you right to an intersection with Kings Highway where you turn right and head west to West End Avenue. Turn Right on to West End Avenue. The funeral home is on the first block.